Have you ever been watching a sporting event or your favorite episode of This is Us and an ad comes on that you have no clue what they were trying to sell you? What’s the deal with that, right? Companies invest millions of dollars a year in advertising to get you and me to open our wallets and buy their product or service. For companies that have larger advertising budgets a miss may not cripple them financially, but for smaller businesses a poor marketing campaign that doesn’t produce results can spell disaster. So what can you do to ensure your marketing message hits the mark? When was the last time you sat down and really looked at your target market? How are you adapting your marketing message and strategies to keep up with the changing market place? How much time are you investing in creating your marketing plan? The first thing I teach my clients when it comes to marketing is – marketing is math! You read that right, marketing is math. A lot of owners look at marketing as an expense, which it is if you’re not measuring the results of the marketing strategy you’re utilizing. We teach our clients that marketing is an investment because we should be bringing more dollars in than are going out. This allows the owner to make better decisions when it comes to where and how they’re investing their marketing dollars. The idea of tracking where leads come from and evaluating the return on investment is critical in understanding what you should be doing more of and what you need to get rid of. Compare your marketing plan to an engine with 16 cylinders. When everything is firing in line and running smoothly, the performance this engine produces is impressive. Leads are flowing into your business consistently and you know precisely where each lead is coming from. In other words, you know exactly what it takes to buy a customer. Target – 10 out of 16 – We’ve hit on this already, but it needs to be stated again. The more specific and clear you are on who is in your target market the better off you’ll be. That is why it is extremely important to invest the proper time to get real clarity around your ideal client. Offer – 4 out 16 – Once you have identified your ideal client, now you can focus your attention on the offer. Take time to create interest and desire with your target audience. Remember having an ‘okay’ offer to the right audience beats a strong offer to the wrong one. Copy – 1 out of 16 – Now that you have your target and offer ready, you can focus on creating copy, or the words you use in your advertisement. Again the clearer you are about your target market and the stronger your offer, the easier it will be to craft your message. Time – 1 out of 16 – Last, and certainly not least, is the timing of your marketing message. Keep in mind that if your business is cyclical you should give some attention to when your marketing is scheduled to go out. I challenge you to go back and look at the results you’ve been getting from your current marketing. If you’re not satisfied or know you could be doing better, I encourage you to implement some of the information provided to get re-focused and clear on just who you’re going after! Share your story with us during your Free 90-minute Action Plan Session. Discover you are not alone. Our actionable, systematic solutions will lead business leaders out of chaos and stagnation. We respect your privacy. Your information will not be shared or sold. Thank you! A member of our team will contact you shortly. Looking for a business coach? Are you a business owner in the Louisville area or Northern Kentucky needing direction to grow your business? Look no further. Meet our award-winning team of business coaches. Create a ready-to-implement plan of action for your business to guide your energy, focus and precision for your business over the next quarter. 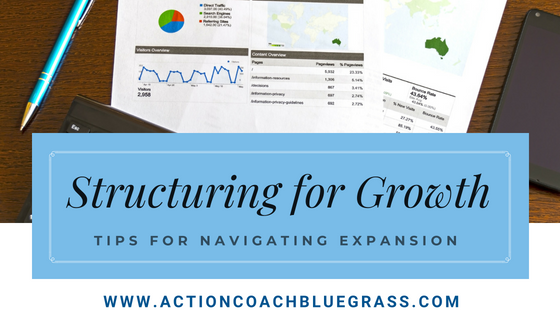 Structuring your company for growth means a few things: Learning how to focus on the right things at the right time; Understanding how growth is likely to impact your company; and Identifying the leadership needs of your much larger organization.